The matter of whether or not Vermont Yankee is allowed to extend its state-issued license (if you don't recall our post on this a while back, Vermont gave itself a hand in nuclear licensing state-wide) is clearly not over yet. This article, and especially the comments added to it, really gives a good view of what's going on in Vermont. Basically, the anti-nuke people are anti-nuke at heart, and that's it. However, they also mistrust Entergy for having supposedly been much less than honest over the years. Further, they're sure that power-sharing over the grid with entities outside the state is the way to go. How long will it take to forget the big multi-state blackout? Apparently in Vermont they already did. Straining an already strained network isn't the answer. I applaud Andy Leader's article and agree that the anti-nuclear view in Vermont is indeed irrational. The NRC has approved an uprate of the two Westinghouse PWR plants at Virginia Power & Light's Surry Nuclear Power Station. These plants were rated 2546 MWt / 799 MWe when built, according to NRC records; the present uprating is from 842 MWe to 857 MWe. Many plants around the US have been uprated - in many cases, inaccuracies in various measurements of plant parameters have been tightened, allowing an increased rating, while in others there have been actual equipment and/or core upgrades. According to this article, the plant uprate will occur in November. 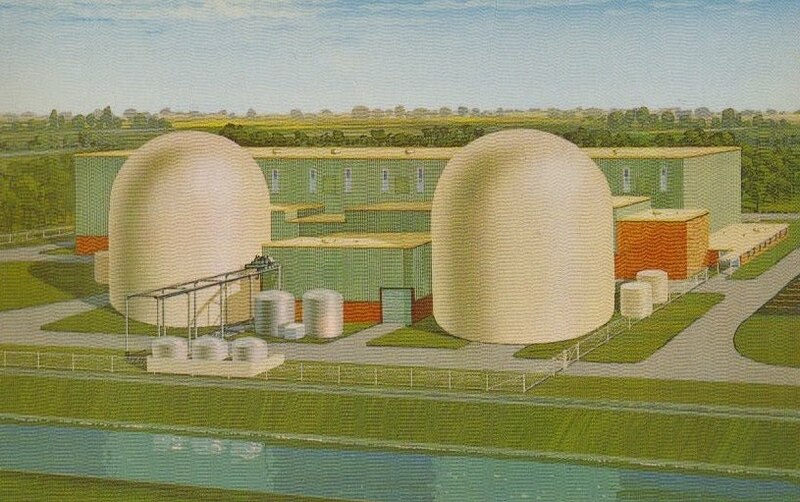 Artist's view of Surry 1 & 2 pre-completion from postcard in APRA library. This article in Business Week describes the indication by Dominion Resources that it needs to increase its base load generating capacity - and that if the company doesn't go ahead with a third reactor plant at its North Anna station then it'll have to build something else. Of course, that could be natural gas or trash burning or a number of other things; we think nuclear makes more sense. I can't put it any better than this article, just published in Industry Week and which is worth reading in whole. I've given the link to see the article all on one page to save you time and ad-reading. Did we jump the gun? No. Everyone with any knowledge -- any real knowledge -- about nuclear has been behind it for years, hating the decline of the industry in our country and watching the sharing then handing off of technology, then responsibility and money, to Japanese firms (both Westinghouse and GE are deeply involved with Japanese firms in regards to nuclear power, while Babcock & Wilcox is not.) The problem is that every time something happens to get the public back in favor of nuclear energy the public quickly gets over whatever crisis frightened them in the first place and goes back to being frightened of nuclear energy. This time, it was the fear of the recession which led the President to, in part, get some money flowing to industry and utilities to stimulate jobs added to fear for the environment when the Gulf of Mexico oil spill happened. Most of the real, sensible reasoning behind both of those decision making paths is still valid now as it was then but the problem is that everyone would like to go back to worrying about which big screen TV to buy and forget about the environment or energy use. Let's keep some things in mind: First, if we're going to prevent another major blackout, we'll need more generating capacity. That's both base load and peak capacity. Second, if we're going to get more independent from oil, we'll need more generating from something else. Third, if we're really worried about greenhouse gases, global warming and oil spills, we need something non-combustive to replace oil. The answer for all of these at once is nuclear. It's proven (see the FitzPatrick entry earlier today) and it's ready. Cost is a factor, but it'll buy peace of mind. Eventual spent fuel storage is a factor, but if the government goes ahead as promised originally with Yucca that problem is already solved. It's right now that we're at the tipping point. The wind was blowing our way, pretty hard, for the last year or so. It's getting eerily calm right now. Entergy's James A. FitzPatrick Nuclear Power Plant (GE BWR-I, 2536 MWt / 852 MWe, online July 28, 1975) just set a US record with 702 days of continuous operation with no failures or safety issues. Read here for details and some other previous records. What a fantastic banner to fly for our side -- this is one that the anti-nuclear crowd can't talk down and can't ignore. This article explained the meeting that was to be held the 13th for public discussion of construction of a new nuclear plant in Ohio. We're looking for the results and will report them when available. Duke may in fact be backing off on this particular plan and focusing on nuclear construction elsewhere, frankly, so we won't get too excited here. Small RX plant at Savannah River? World Nuclear News reported on the 10th that Hyperion has a fresh agreement with the DoE to construct one of its proprietary small, fast reactors for testing with an expected output of roughly 75 MWt / 25 MWe. Apparently there are some shortcuts through the red tape that would normally obstruct building this new design at, say, a commercially operated site since DoE plans to build this unit at the Savannah River Site. This fast-tracking would get the reactor built much sooner than if it were built for commercial power generation and operated by a utility. With the seeming very recent cooling down of the nuclear fervor, let's hope this gets done. 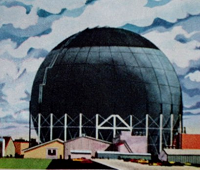 As I continue to follow the progress of the various projects here and abroad to advance nuclear energy, I can't help but wonder if we're all feeling just a tiny bit of the excitement and anticipation that was felt back in the 50's, when the technology was relatively in its infancy. This brings to mind Power Reactor License No. 1, issued by the AEC for GE's Vallecitos Boiling Water Reactor. 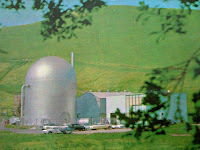 VBWR was conceived in 1955 as a prototype and dress rehearsal for the much larger project that became Dresden-1, and a new Vallecitos Atomic Laboratory was built near Pleasanton, California. The construction permit from the AEC was received in June 1956, and very rapid construction led to completion one year later. 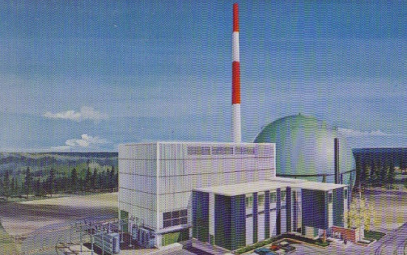 VBWR was a test plant, and so could operate both as a direct-cycle boiling water reactor and as a dual-cycle boiling water reactor (which latter duplicated Dresden as finally built.) 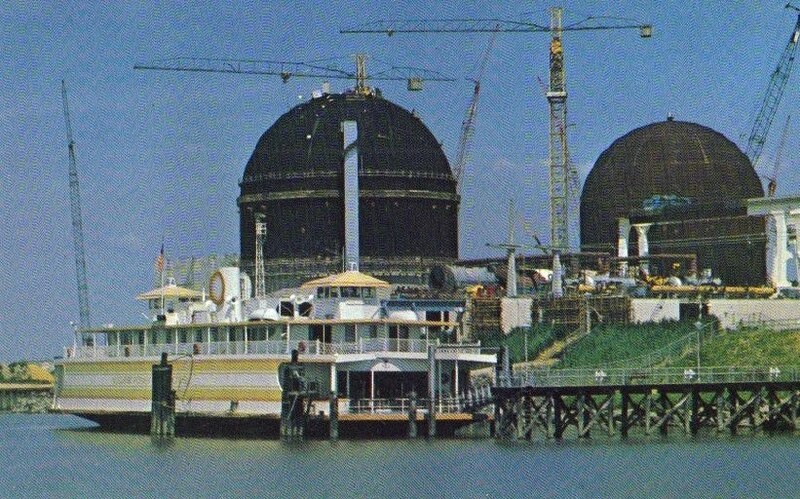 During the planning it was decided to actually build an electric generating station to connect to the Pacific Gas & Electric system, and PG&E shared costs and provided a 5000 KW generator salvaged from a ship and modified. Core power of VBWR was designed as 20 MWt but the reactor on test proved capable of developing 30 MWt with no adverse effects. Initial criticality occurred October 17, 1957; on October 24 the plant was placed on the PG&E grid and delivered the full rated 5 MWe. Later AEC documents for siting indicate, for purpose of source term calculation, a core power of 50 MWt. Operation continued through 1963, when the plant was shut down. Vallecitos remains in SAFSTOR today, although it isn't alone like it was in the photo above. 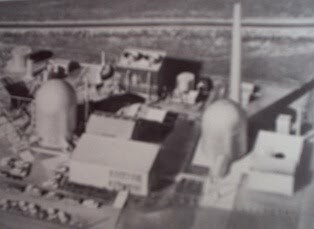 Another reactor was built alongside of it and although originally it was planned to operate in tandem as a superheater plant, eventually the second plant was left on its own. Here we see, on the left, the original VBWR. 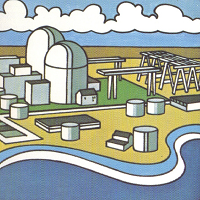 In this illustration, an artist has added (from blueprints) on the right the plans for the ESADA VESR reactor. Empire State Atomic Development Associates, a group of seven New York state utilities, was formed to investigate three high-efficiency reactor designs through investment with, and contracts with, major reactor vendors. The VESR, or Vallecitos Experimental Superheat Reactor, was one of these. 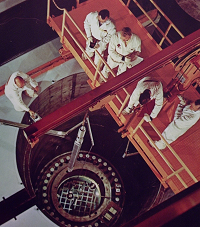 This was a 12.5 MWt reactor designed to be operated with steam supplied by the VBWR. According to the scant information available, this probably only happened for a short time if at all since the superheat reactor only started up for the first time in November 1963. After that, until the reactor was shut down and the license made 'possession only' in 1970, it operated on its own investigating superheating elements for boiling water reactors. In some early documents this same reactor is referred to as the EVSR or Experimental Vallecitos Superheat Reactor. It's easy to see why this letter system was abandoned. We all know the result of GE's having built Vallecitos Laboratory; the highly successful Dresden Nuclear Generating Station, and many more (and much more advanced) GE boiling water reactors since. Dresden Nuclear Power Station, Grundy County Illinois; first criticality October 1959. Original rating 626 MWt / 184 MWe, later 700 MWt / 200 MWe. Very complicated dual-cycle construction, with high external central steam drum and four secondary circulator loops each with pump and steam generator. Big Rock Point, near Charlevoix Michigan. 240 MWt core power, although not initially; plant initially rated 48 MWe but later increased incrementally to 71 MWe although the target had been 75 MWe. First criticality September 1962. I hope you've enjoyed this very brief look back in time - and now it's time to move forward! A good day for Westinghouse? Another hurdle for Vogtle cleared; click here to read a brief AP piece reporting that a draft report issued by the NRC has vacated any environmental concerns about the plan to build two new Westinghouse AP1000 plants at the Vogtle site. Given FPL's rate hike (see earlier post) it looks like a good day for Westinghouse. Rate increases have been approved for customers of Florida Power & Light, which is on track to acquire funds to construct two more generating plants at its Turkey Point Generating Station. A recent article can be seen here. Turkey Point 1, 2 and 5 are conventional (ie, non-nuclear) plants while Turkey Point 3 & 4 are Westinghouse 3-loop PWR's whose construction began in 1967. These plants are rated 2300 MWt / 693 MWe. The intention is that Turkey Point 6 & 7 will be Westinghouse AP1000 plants, rated 3415 MWt / 1117 MWe. You can find a link to Westinghouse's site on the links section and there's a great pdf brochure on the AP1000 that's downloadable free. Click here to see FPL's official information about Turkey Point 3 & 4. Our atomic showpiece vessel was, and remains, the N.S. 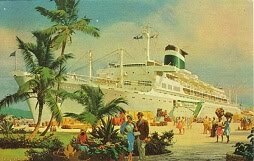 Savannah; you can find links to see a great deal about this ship on this blog's home page. The showpiece of the former USSR was the atomic powered icebreaker Lenin. Clicking here will take you to a fabulous photo tour including many incredible interior spaces, decorated fantastically for 1959 when it entered service. Viewed also are the actual reactor control room and a view into the reactor compartment. Enjoy! NRC reports show Surry at 98% power on the 17th and 100% on the 18th and today; apparent then that the voltage regulator problem was fixed quickly. Apparently Surry 2 did not complete the restart after turbine generator voltage regulator problems surfaced, contradicting our earlier report in this blog and as of this writing has not gone back on line. Further, a steam leak at North Anna 1 forced a shutdown Wednesday evening and that plant isn't on line either. Surry 1 and North Anna 2 are steaming at rated capacity. Click here for a brief local article. All four are operated by Dominion Virginia Power. North Anna 1 and 2 are Westinghouse 3-loop PWR's rated 2893 MWt / 903 MWe and which went online in 1978 and 1980. Surry 1 and 2 are also Westinghouse 3-loop PWR's, rated 2546 MWt / 799 MWe and went online in 1972 and 1973. 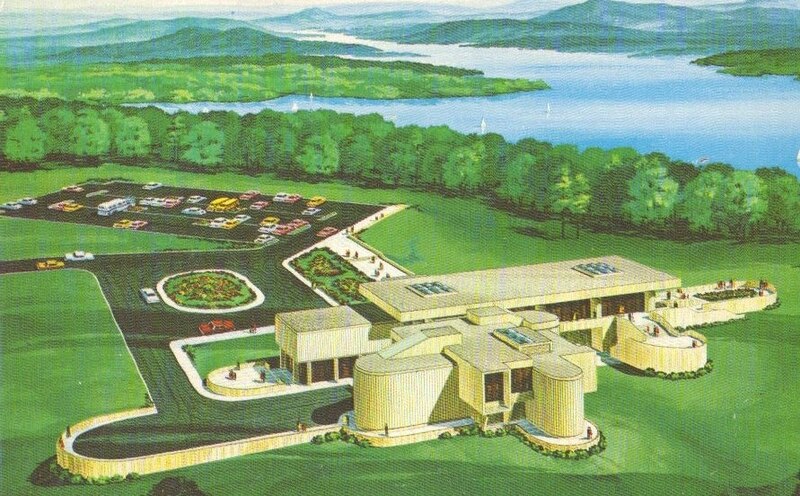 We provided an illustration of the Surry Nuclear Power Station on this blog previously; see the older post. PR Newswire is reporting that Susquehanna 1 shut down today when a leak of river water began in the lower level of the turbine building. It sounds as if a manhole or inspection hatch on the condenser was the source of the leak. Click here for PR Newswire's brief story. The Brattleboro Reformer has been doing a bang-up job of covering all angles of the Vermont Yankee stew that's brewing up in Vermont .. so here is a hot link to today's report by that fine paper. I myself keep bringing the Vermont Yankee story up because it's really the most "down to the wire" of the stories surrounding operating plants that would need renewals or extensions and are right up against deadlines. Or that have a bunch of numbskull interference by witless politicians (are you getting this, Vermont legislature?) It's been pointed out in a few places and certainly on this blog that Vermont would lose about one third of its generating capacity if Vermont Yankee closed; it would then have to rely on power from elsewhere and be subject not only to external rate setting but very likely increased outages. Is that smart? Would higher rates and lower reliability cause industry and business to move into, or out of, Vermont? We'll see. Bechtel, Babcock & Wilcox form a consortium to build small Nuclear Steam Supply systems; see this link. B&W was shopping a design it called the CNSS (the "C" was for "Consolidated") pretty soon after the N.S. Savannah was built, and in fact the OTTO HAHN employed such a system for propulsion. The CNSS featured all components inside the primary containment including pumps and steam generators. This (the small reactor system) is one well thought out, well discussed but non-starting approach that probably should be pursued; the companies' statements about the system's application and future should be read and noted. It appears by this article and others that the pro-nuclear Vermont Energy Partnership has been closed out of NRC meetings with concerned parties that are being held relative to Vermont Yankee's continued operation. Want to know what Vermont Energy Partnership, or VTEP, is all about? Click here and see the video. It's incredible. SEE the founder of Greenpeace standing on top of the reactor containment inside Vermont Yankee! See him in the control room. See and hear his PRO-NUCLEAR information. And, learn a lot about Vermont Yankee. "This is the nuclear renaissance." I .. and we .. have been saying that for about a year now. Vermont- are you listening?! Surry 2 is back on line today after a brief outage that began Sunday night with discovery of a leak on the river side of one of the condensers. This article gives a brief statement about this and a good picture of Surry now; I've included here with this post a picture (click to expand it) that gives an artist's conception of how Surry 1 & 2 would eventually appear- the art is before completion. Bloomberg is reporting that the hiring paperwork omission that has held up construction work at the Vogtle site is cleared up and that construction might restart today or tomorrow. The site will add two new Westinghouse AP1000 plants with this project; see earlier posts on this topic. Good news for once; an anniversary! Catawba Nuclear Station just hit 25 years of operation, as reported by the Herald out of Rock Hill, S.C. The plant is owned and operated by Duke Energy; the two plants are Westinghouse four-loop PWR's rated 3411 MWt / 1129 MWe and went into service in June 1985 and August 1986. The operating licenses have been extended for both through December 2043. Today it was announced that McDermott Industries will indeed spin off B&W by issuance of new shares of B&W stock, one for each two shares of McDermott held. This action is expected to occur before the end of July. Here is McDermott's official release on the matter. Apparently, a required screening form was omitted when new hires were made for work on what might become Vogtle 3 and 4; this resulted in the temporary halt of work on the site until the proper forms are filled out by the employees and returned. This article sums it up. It isn't anything major but I do report everything of note that I find. I happened upon this link while looking around at the great information that Duke has to offer online and I think it's a great thing that the company not only has two operating visitor centers and a great website but also features plans on future nuclear construction. This is how you do it. Use the Westinghouse link over on the right of the blog page to find out about the Westinghouse AP1000 reactor plants that Duke intends to have constructed for this project. There's a good pdf brochure to download at the site. Oconee Visitor Center still operating! Incredibly, the old Keowee-Toxaway Visitor Center built right by Oconee Nuclear Station is still open! Click on the photo and it should enlarge. Click here and see Duke Energy's present site and look around. The company also still operates the EnergyExplorium by McGuire Nuclear Station. Yes, I'm enjoying myself with BING maps. Here's a link showing the still in-place, SAFSTOR Piqua Nuclear Power Facility. This organic-moderated and cooled reactor sent steam over a small bridge across the river to the original Piqua powerhouse, explaining why there's no turbine building or electric switchyard visible here. Use of this link should give a view of the site of the old Carolinas-Virginia Tube Reactor which operated 1963-1967 and which has apparently been totally decommissioned (of course) and demolished. Some recent safety findings by NRC inspectors are to be discussed in public meeting on the 13th of July. This article details the meeting for those wishing to attend and gives a brief synopsis of the scenario, which, to parallel the quote given, sounds just slightly greater than green anyway. Northern States operates two plants at that site, Prairie Island 1 and 2 which are Westinghouse two-loop PWR's rated 1650 MWt and which were placed online in 1973 snd 1974. Northern States is a subsidiary of Xcel Energy. India - nuclear energy expansion - Korea? According to this very well written and concise article, India may be next in line for Korean nuclear plant construction. The article linked gives the briefest thumbnail view of Korea's rise to a notable position as an exporter of nuclear plants (even though none have been built yet, I should add - they're just contracts at this writing) and echoes posts I've made here over time, including today. The nation of Morocco expects that if all goes well it'll have nuclear energy on line in roughly 12 to 14 years, if this article is to be believed. There have been a lot of announcements of this general type within the last several months, and it's no wonder that Japanese companies have teamed with their government to get some of these foreign contracts. While no hard contract has been made in the case of Morocco, the steps discussed in the article linked are necessary to get there. Once again, one wonders whether or not any US companies were considered. Will there only be one or two potential nations left to bid on before we get going too? Reports are out today that Saudi Arabia will sign a deal with France for nuclear energy technology to both provide electricity and to provide fresh water. Several articles are available; here is a concise one from a reliable source. Is this to result in a contract between the Saudi government and Areva that a company here (see links on the blog page) could have had? Yes, very likely. Several Japanese corporations have grouped together with funding from the Japanese government to develop a consortium whose purpose is the export of nuclear energy through out-of-country contract plant construction. This article today in the Wall Street Journal, echoed by several others, is not much of a surprise to this author. Surely there was as much disappointment in Japan as anywhere when the UAE (United Arab Emirates) selected a South Korean bid for construction of new nuclear plants; the announcements since then by Nigeria and Vietnam, among others, cannot then be allowed to pass without serious attempts. Thus, the government-backed consortium. This isn't different really in broad concept from the AEC-funded plants built here in the several rounds of the Power Demonstration Reactor Program; one was even built in Puerto Rico under that program. We know the concept has merit. The point is that now, during the 21st Century Nuclear Renaissance, the Japanese are preparing to use that same sort of thinking to get export contracts. Do we need a similar program here to stimulate jobs and maintain our position in the industry? I wonder. Plowshare was the overall name given to US projects during the 60's and 70's that used nuclear devices (that's weapons, folks) to perform peaceful functions like creating massive water reservoirs, or tapping natural gas deposits that were encased in rock, or creating large underground stored energy reservoirs. There were many ideas and many tests. The Soviets had a similar program, and also dug canal sections with lines of devices. The ghost of such projects has appeared again, and seems not to be disappearing with just a glimpse. Now, as shown in this article, one of the men directly involved with the old Soviet program feels that the Deepwater Horizon drill site that BP is fighting with in the Gulf of Mexico should be .. nuked. I mentioned this idea once before in this blog and I'd like to point out that while the Soviets did apparently attempt to test this concept with above-ground operations it's never been tested a mile under water with, if I've read correctly, about a 4,500 psig difference between sea pressure at that depth and well head pressure. You would need to liquify and then instantly cool a large amount of material to fully seal the well off, it seems to me; making a big rubble pile will just result in a half square mile of porous oil-leaking sea bed. What makes me mention this again is the fact that someone who actually DID WORK with such a program is now advocating the idea. 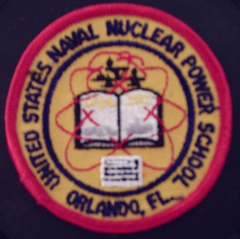 I've always admired our nuclear weaponeers, particularly Dr. Edward Teller and Dr. Frank Shelton, and I wonder myself, now, if anyone still living here with direct Plowshare experience has been contacted for an opinion. Calvert Cliffs, Summer and South Texas sites are on the list now for loans as noted in this article which I now link here for completeness. As noted in this article, these are on top of guarantees I mentioned here a while back for Vogtle in Georgia. Sometime soon I'll compile a list of all the working projects that have gotten to the loan guarantee phase (even though you could do that from posts here with some effort) and start a running commentary on project status for all of them. That way, progress on all serious working projects here in the US will be easier for everyone to follow in encapsulated form. It's very reassuring to note that the nuclear renaissance is getting wide enough to need boiling down, isn't it? Did everyone notice how the South Koreans made the decision some years back to enter the US automobile market? They did it; Hyundai is now a perfectly viable and competitive brand. This article ought to make it clear (if it isn't already after the UAE contract I've mentioned here before) that their ambitions aren't by any means limited to the roads and highways. All right. Normally I don't pay attention to news reports about nuclear energy in foreign countries, but this one's worth looking at since the British media here sounds a lot like the media here twenty years ago or so. First; why does any fire anywhere at a nuclear power plant have to be a "blaze?" Doesn't "fire" work well enough? Would they use "conflagration" or "pre-apocalyptic inferno" if it wouldn't reduce the headline's font size to unreadability? Probably, if the general average anti-nuclear alarmist could understand it, which in itself is highly unlikely. So "blaze" is the best choice to express near-total disaster with one word if you have to, which of course we all know is exactly what you must have when there's any kind of a fire at a nuclear power plant. Right? Well isn't it? I mean, you can't have a "blaze" at a Ford plant, can you? Second, a statement by some anti-nuclear organization leader: "Making electricity from nuclear energy is a highly-dangerous (sic) process." Counterpoint- a statement by an experienced person who spent years on board a submarine operating a nuclear plant: Wrong. Notice how the "Level 0 emergency" event status is buried waaaay down in the article, right above pointless statements about how many fire companies were called to respond. At the end, we find out the most important fact: No evacuations, and so nothing happened. Well, get Babcock & Wilcox to do it then! This article complains strenuously about foreign-made components being included in all of the presently planned new-construction nuclear plants. First; did anyone lament the loss of such manufacturing capability when those facilities that shut down here actually did shut down? Second, a look at Babcock & Wilcox's site reveals that it can still fabricate pressure vessels and closure heads which are among the largest components; it can also fabricate two general types of steam generator, which it is in fact doing for replacement installations in US plants. Let's face it; some of our manufacturing capacity here was allowed to shut down with no (or almost no) public outcry even though those of us with any experience knew what was being allowed to happen. Sure, companies can't maintain staff and equipment just in case future orders might come in- there's certainly no profit in that. My point is that the manufacturing base DID erode and people knew it. Let's move past that and get the plants built. Perhaps B&W can fabricate components under sub-contract for the other primary vendors or perhaps the loan guarantees could stipulate that if it's that important. It seems that tritium has been detected in samples of groundwater around LaSalle County Generating Station. Exelon, owner of the site (LaSalle 1 and 2, GE BWR-II and 3489 MWt and rated 1118/1120 MWe by NRC records but stated by Exelon as 1138/1150 MWe net) states that the situation is under control. See this article. Also see Exelon's site here for a page on LaSalle County Generating Station. The initial moves to get a third plant at the Calvert Cliffs site are underway. This article indicates that loan guarantees are being sought for a joint project with Areva to increase generating capacity at that site. Calvert Cliffs 1 and 2 are Combustion Engineering PWR plants rated 2700 MWt and 873/862 MWe respectively and which entered service in 1975 and 1977 respectively. It looks like another early but important step in Utah getting a nuclear plant built has been taken. This article describes the funding arrangements being made for a new three-reactor 4500 MWe site. The comments on this article seem to indicate fear on the part of residents-- fear of conspiracy (since supposedly all the generated power will be sold to the West Coast on the grid) and fear of water shortage (since there's little water, the plants will take it all.) I don't know about any of that since I don't live there and am not involved in Utah politics, such as they are but I can tell you that seeing any opposition to any nuclear plant is no surprise. This article on an admittedly liberal "news" site is just irritating. However, this is just one brand of stupidity we face. The quote "wealthy nuclear power industry" and its use in anything other than a joke is just ludicrous. I linked another article from .. I can't recall where .. last week and the link is still of course in the blog archive. That article gave a capacity factor for installed wind turbine power in the United States at something right around 30%. Nuclear capacity factor was on average somewhere around 90%. Does anyone think that wind and solar are the answers to our overloaded and underpowered electric grid in the United States? Not at 30% capacity factor. There's too much money in THAT angle- the "green" angle - for no payoff to the end users. There's just feeling that you are behind something good, which is nice but at the end of the day will still leave you in the dark. It's time to get more educated out there, libs! At least two sources are now reporting that the NRC has effectively told the DoE that it isn't a policy-making entity and that it cannot stop the Yucca Mountain waste disposal site project, and neither can the President right now, unless and until legislation is passed by Congress to reverse its previous law. In other words, the enviro-nuts can't just step in and stop something that's already legislated and mandated. Good for the NRC, I say; we need this project and many others working right now to serve their roles in the resurgence of nuclear energy. It looks like another nuclear plant may be built in Idaho, which until recently didn't have plans for even one (outside of the long history of NRTS that is.) This article today reveals developments surrounding zoning for a second. It's good to see the 3 to 1 approval rating quoted since it reflects today's reality with the populus and not yesterday's fears of the mass media.